Do not plan a meeting if there is no purpose for it. Before your next meeting, think through the following questions: What will we discuss or decide? Who are the people I need for this discussion/decision? What is the information needed for this discussion/decision? If you can not answer all of these questions, do not call the meeting! Find out ahead of time if meeting participants know each other. If they don't, you must invest time at the beginning of a session to create enough trust and safety for the group to be able to communicate and collaborate. Even a simple check-in or a request that people introduce themselves to someone they do not know can help establish a human connection. Make sure everyone is clear about the purpose of the meeting. Sadly, many meeting organizers are not very explicit about why the group needs to gather. This lack of clarity creates a breeding ground for boredom and frustration and can be interpreted as a lack of respect for the participants’ time. Define the purpose and expected meeting outcomes. This will give the participants a common cause and motivation to relate to each other. Give all team members a chance to contribute to the agenda. Understood as the work plan or road map for a meeting, the agenda —and the process for creating it— are indicators of the leadership style and collaborative values of the group. Smart leaders recognize that team meetings are opportunities to address issues that require collaborative effort; therefore, they involve the group in the development of the agenda. Establish a Meeting "Time Budget." Making optimal use of the group’s time is one of the critical success factors in any meeting. So how do you decide how much time to allot for each issue on the agenda? Start by determining the duration of the meeting. Calculate the time available for discussing and deciding, then add time to open and close the meeting. If the result seems like too little time to produce the desired outcome, then look for ways to reassign time from other agenda items until you have "balanced your time budget." Aim to prevent the "laundry list" syndrome. The laundry list gives the misleading impression that whatever is mentioned in the list will be discussed and/or decided. Long lists of random items tend to paralyze rather than energize, and if repeated too frequently, it can produce a "here we go again" response. Instead, spend time grouping like items, naming the groups, and prioritizing the named groups. Assign each group a category: Urgent, important, or not now. This will help determine what needs to be reviewed during the meeting and encourage tangible outcomes. In long meetings, add time to the agenda for working in pairs or small groups. Longer meetings in which all discussion occurs in plenary are a recipe for isolation. The extroverts talk a lot while the timid sit in silence and the rest are surreptitiously checking their email. Create a results-oriented process that stimulates interaction among the group members. Never compete with a smartphone. You will lose. People who are checking their email, exchanging text messages, or surfing the web during a meeting are NOT fully engaged with the rest of the group. We need to consider our choices: Tolerate, Ban, or Incorporate. The leader/facilitator should propose the preferred choice at the start of each meeting, and if the group accepts the proposal, the decision must be universal. Adjourn a meeting when the objective has been achieved. Too often, meetings are called without the team leader or meeting convener having completed this crucial sentence: "By the end of this meeting we will have…"
Once a meeting leader has clarity about the purpose of the meeting, they know exactly who to invite. The selected participants arrive at the meetings fully aware of the task before them, and ideally they have reviewed relevant information ahead of time. When the objective has been reached, the meeting is adjourned. Find a way for team members to collaborate between meetings. Not everything can or should be accomplished in meetings of the whole group. Committees and other small work groups are an excellent way to both make progress on important tasks and for people to get to know one another better. The tips above give you a sense of Beatrice's perspective on what makes for an effective meeting. What they don't show, however, is how committed she is to finding practical and realistic ways to put that advice to use. 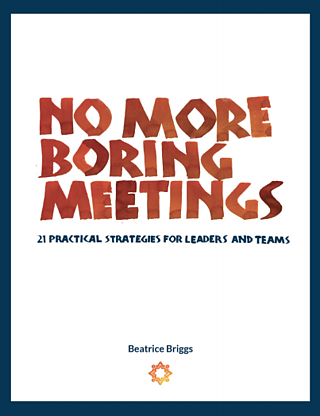 Unlike many books you'll find on meetings, there's no long preamble here that tries to convince you to care about meetings. This booklet is not about preaching or shaming. 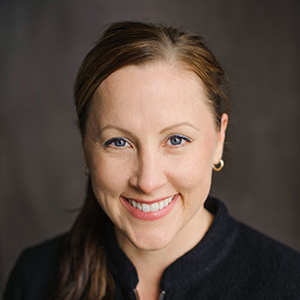 Instead, Beatrice delivers a series of worksheets, questionnaires, and simple examples that lay out a how leaders can tackle the tricky human side of making a meaningful change. To see more of Beatrice's practical meeting strategies, download the full e-book. If you've been waiting for the right time to create change in your organization, the time is now. Most work happens in your regular business meetings, so if your teams are not running great meetings, you can’t run a great organization. Even though ineffective meetings can drag businesses down, there are proven and reliable ways to make them work for you. Organizations and teams that meet well consistently outperform their competitors on every scale. Identify the right meeting strategy for your business. Teach your team how to run those meetings well. Establish technology and coaching systems that ensure a successful transition to effective best practices. Transform meetings into a source of leadership development and organizational health. Want to learn if this program is right for you? Take the self-evaluation survey or request a free discovery consultation.